I feel sorry for some areas of the country which have gotten something like 5 inches of snow unseasonably early. One shouldn't have to rake leaves and shovel snow at the same time; it's clearly a sign of the end of days. I suspect dressing as a Canadian will be a popular costume this year. Anyhow, I felt like sharing this with all of you. The Hercule Poirot series has only risen in quality over the years. What started as a series of hour long episodes have turned into mini movies in more recent years. Often they do great justice to the novels they're based though sometimes they do miss the mark. For example "Taken at the Flood" is supposed to be about a murderer taking advantage of a natural disaster. For whatever reason this fact was ignored in the series production. Occasionally they'd improve on the novels though. For example in the novel "Cards on the Table" two of the four main suspects are killed off rather than proven innocent. The series changed this and otherwise stayed fairly true to the novel. So I present Agatha Christie's "Hallowe'en Party." It's a good mystery. It's one of Christie's ones that can be solved early on if you're paying attention. If you miss the detail that solves it all it will leave you gasping that you missed it. Or at least that's how I felt. The motive though is a little melodramatic, and they don't really play up the macabre aspects of what's going on. Sorry for not blogging anything for the past week. Basically the weather here has been miserable and in fact it's snowing right now. Hopefully the following post makes it up to you all. I spent the day at the Mt. 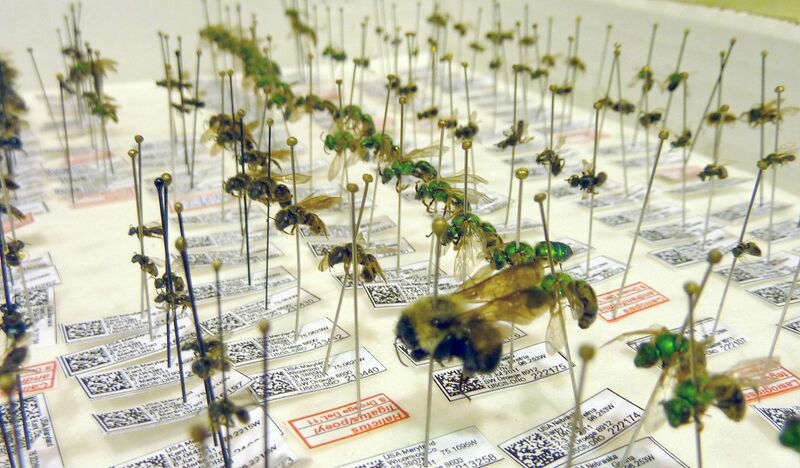 Cuba Center for their class on Native Bees. I can't recommend courses at the Mt. Cuba Center highly enough. That place should be a national treasure. That said though I felt today's course could have been structured slightly better. The first half was done well enough the instructor started going into common bee genera and it wasn't very apparent that they were in any logical order, or at least as logical as it should have been. The real issue I think was that the class and material he usually gives takes 5 days to complete, and he had to sum it all up in 3 hours. He didn't go over different nesting type or habitats. 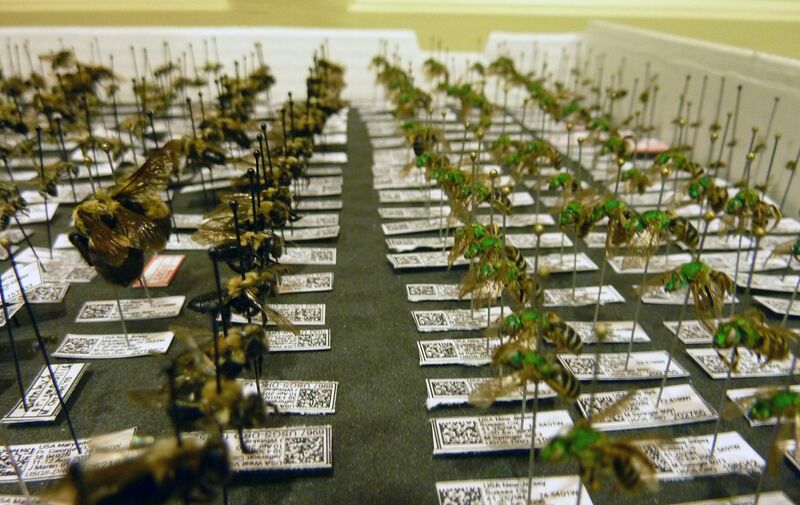 Most surprisingly of all, he suggested that it might be bad to put out mason bee nest blocks because it helps the spread of an two invasive species. Putting out the nesting blocks is like a double edged sword. He didn't really go into it as much as I'd have liked. Though personally I'd need the 5 day version of the course to learn all the taxonomy. What he did cover was excellent and mostly focused on how flower shape and color have shaped their pollinator bee counterparts. 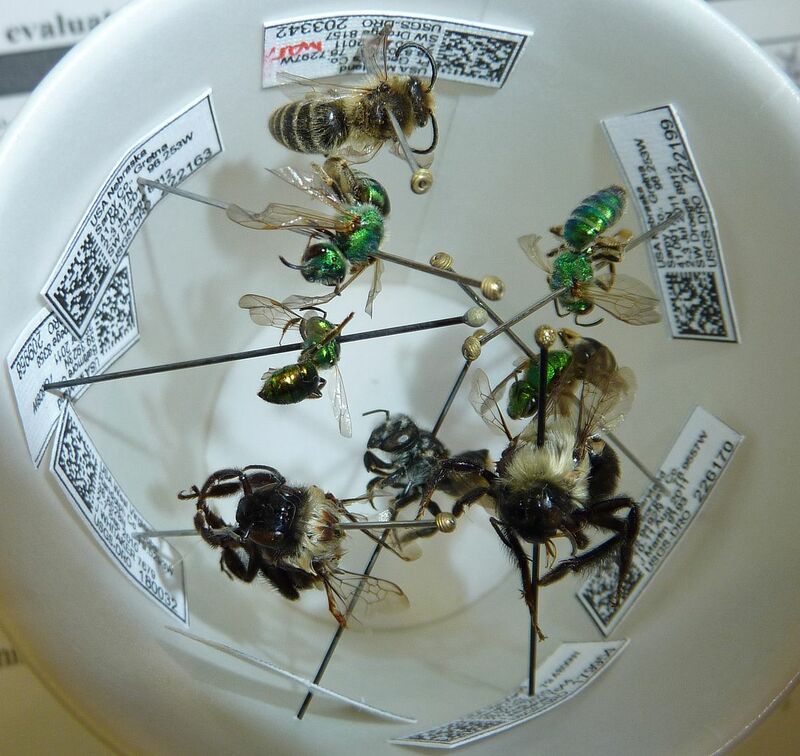 He mentioned studies that show getting rid of the pollinator doesn't cause the plant to vanish typically, but getting rid of the plant can get cause the specialist bee to vanish. North American is not a very species rich continent, but when it comes to bees, we're one of the top continents in the world. Because of these specialist relationships with plants, especially in the south west where mountain ranges keep lots of arid micro-habitats isolated. 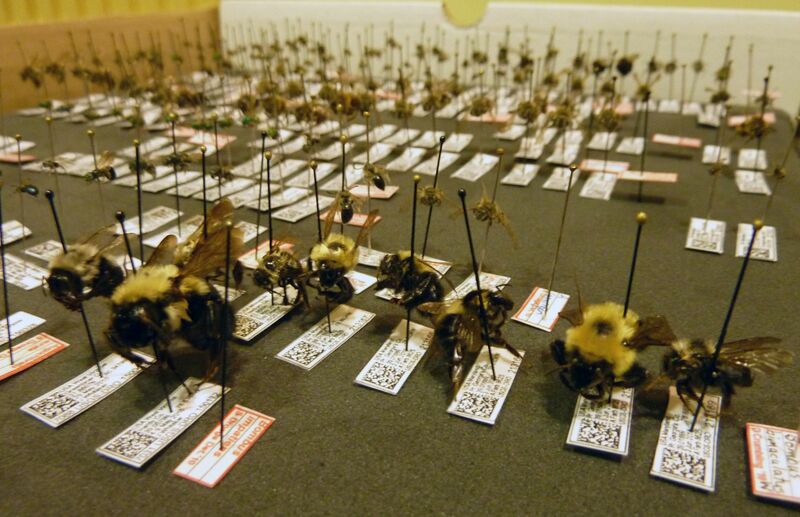 The diversity of plant species there have greatly increased the diversity of bees who pollinate them. The focus on the class was on species found in Maryland and Delaware area. 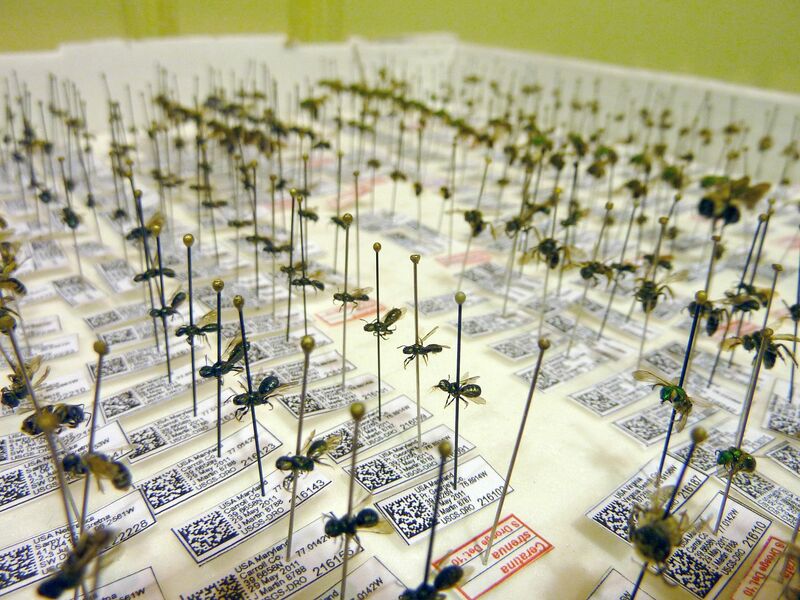 I noted though some specimens were collected from New Jersey, and New York. Dissecting scopes and microscopes were on hand to view these up close. 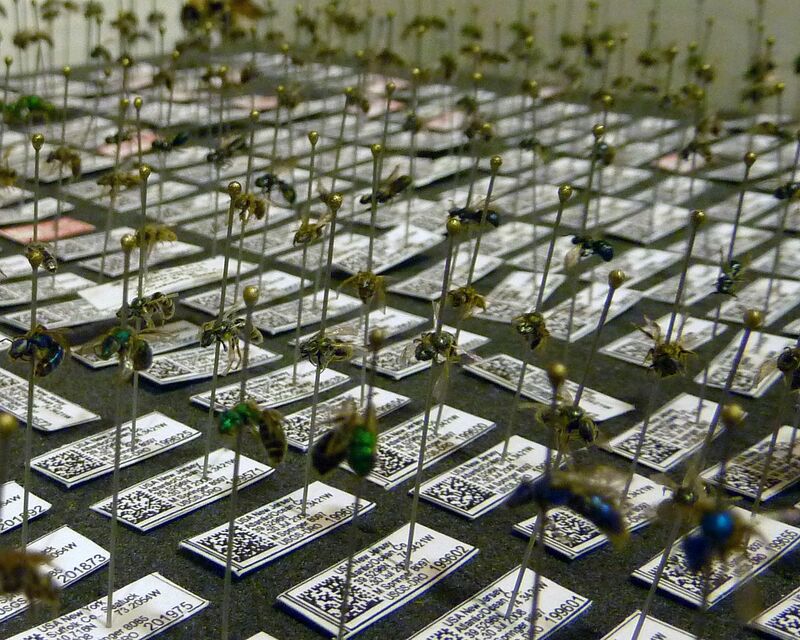 All the species present were common enough that anyone attending the class was allowed to take some home. Despite a lot of these being repeats of the same species, there certainly are a lot of them here. Of the 10 or so trays (medium sized pizza boxes with foam in the bottom) there were about 75 species represented. One species not prescient went back to the association with specific plants. There's an alien species of Centaurea (Bachelor Buttons) which is spreading along rail road tracks and highway mediums. 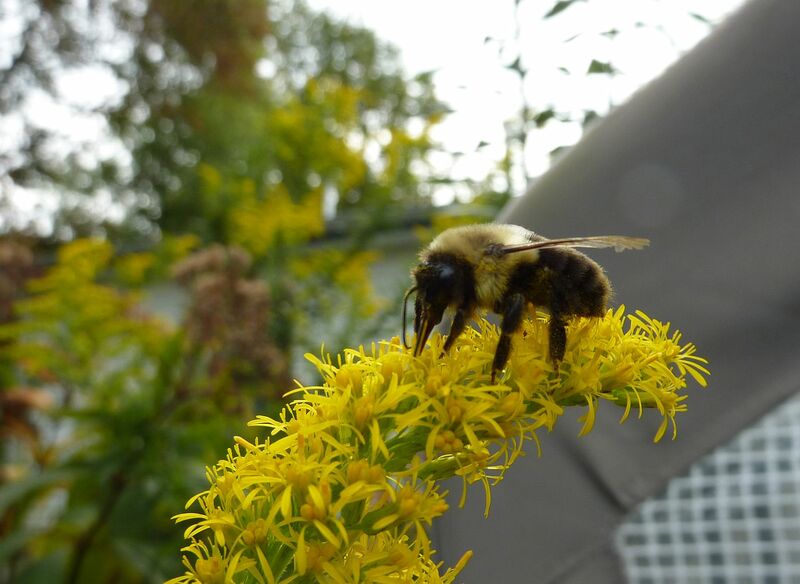 An introduced pollinator is spreading along with it, but the trouble is it's a carpenter bee without a preference for soft wood. Wooden houses where the plant and bee are present get riddled with holes on the outside more severely than any of our native and introduced carpenter bees. It just goes to show why native plants are important. 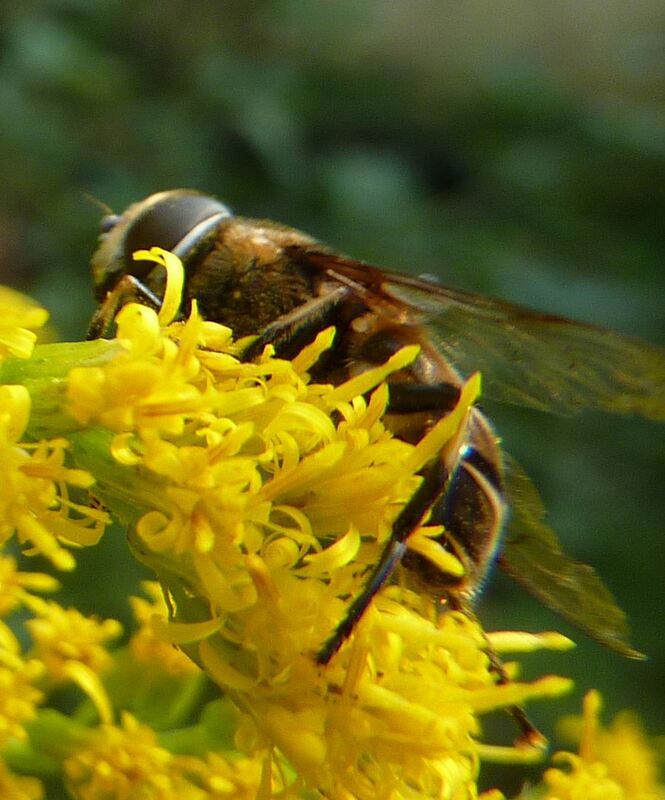 What's more, it's neat to think this bee can be controlled simply by weeding out the introduced alien plants. 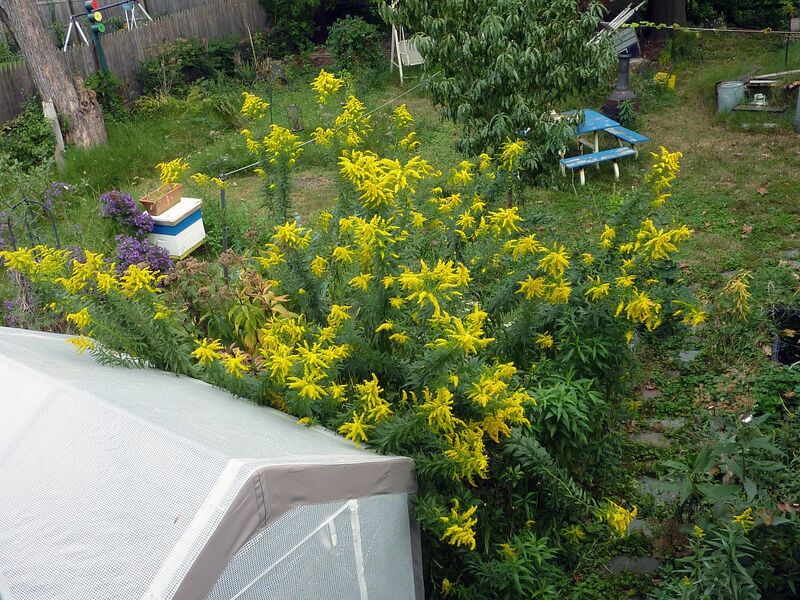 Well the Solidago altissima, Tall Goldenrod, is back in bloom. It doesn't quite make it to our first frost but it's late enough that ... frankly I don't think anything else that's native is flowering! We have a white flowering Chrysanthemum that blooms a little later but I've never seen any bees on that plant. The canes are once again reaching 13' tall and Bumblebee queens (left) are showing up slowly as they did last year. Workers and possibly males (right) are also showing up and more diligently working the flowers. 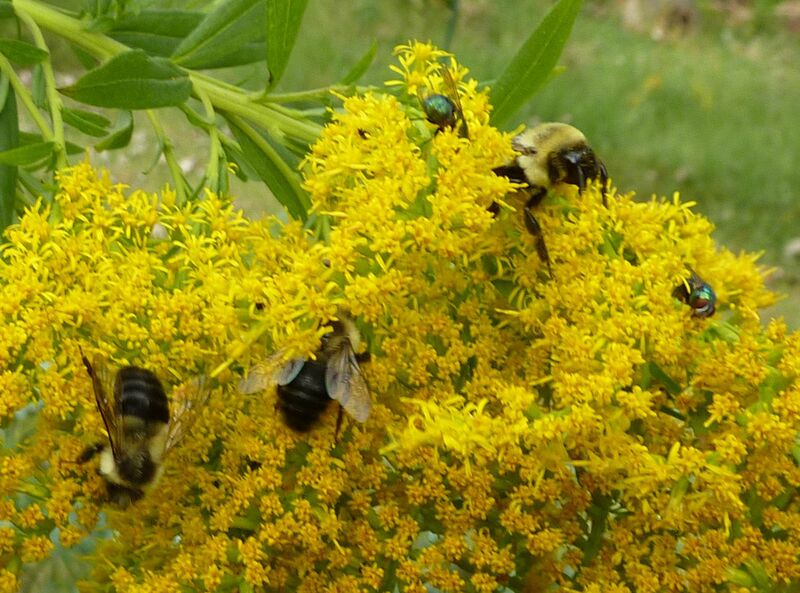 All manner of pollinator seem to be swarming over this plant. There are even swarms of tiny sweat bees who all seem to work flowers next to one another. 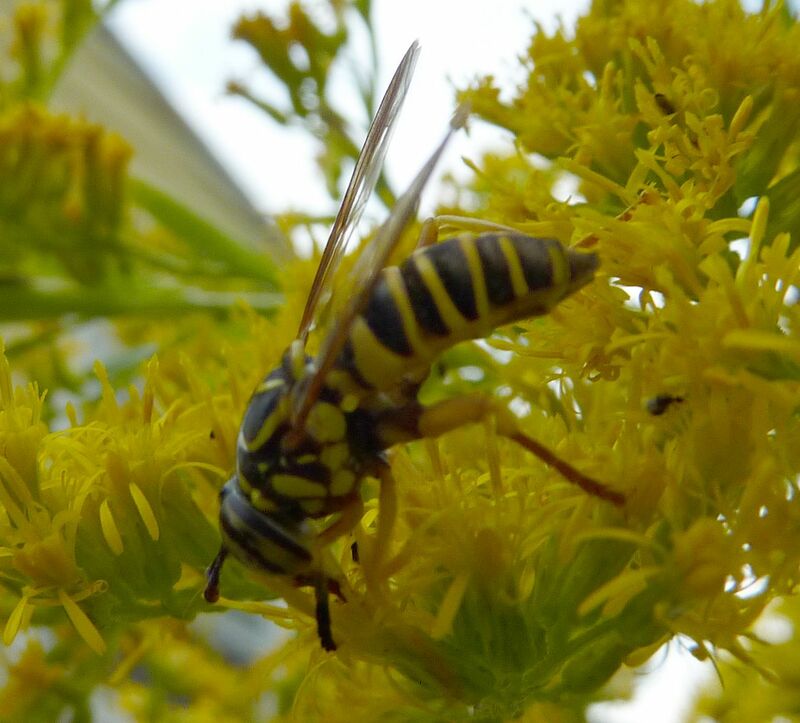 Droves of Flower Flies which mimic both bumblebees and wasps are all over this plant. 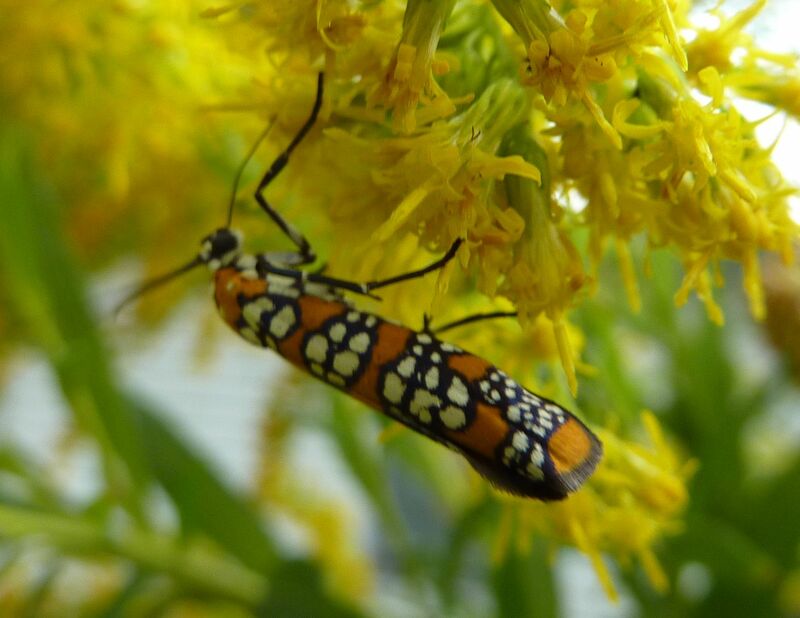 Atteva aurea, The Ailanthus Webworm, is an attractive little moth that's easily identified as it's the only member of the genus in North America. The common name refers to the host plant's genus, The Tree of Heaven, a fast growing invasive tree. 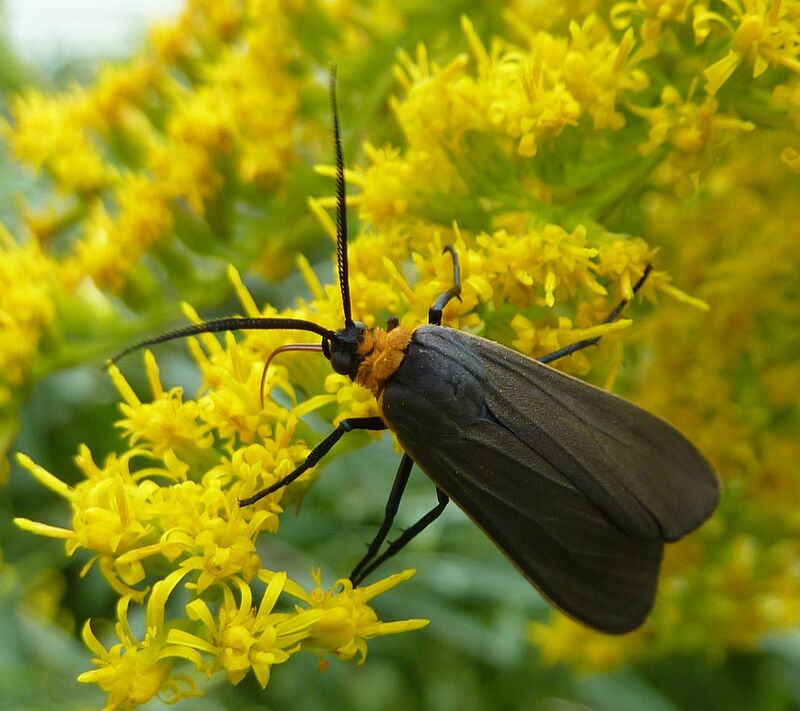 Ctenucha fulvicollis, Yellow-Collared Scape Moth, are commonly seen on Goldenrods throughout the autumn. Shortly after I'd recorded the video way above, a Monarch came fluttering bye. It didn't land very long and was quick to take off. 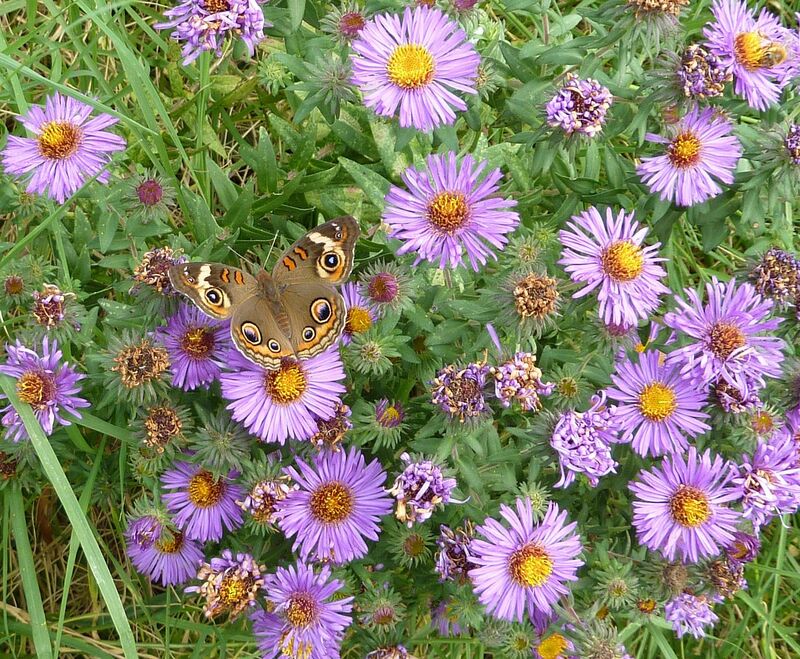 Much like honeybees I find Monarchs seem to prefer Asters when given the choice. The topic of birding is treated with respect and there are a lot featured in this movie. Which brings me to my biggest complaint with the film. As soon as the credits start rolling the audience is Assaulted! by 755 bird pictures which all flash on the screen at a nauseating pace. This is completely out of character with the pacing and attitude of movie preceding it, and down right distracting from the people names of people who made the movie. I couldn't tell you who directed, who the writer was, weather or not it was based on a true story. I had to look away a couple of times because I was getting flashed by so many birds. I felt like a nun stuck in the middle of a naked marathon. The bottom line is the general public will hate this movie. For people who are into birds or have an appreciation of taxonomy (not taxidermy! though they might like it too,) you'll get more out of this film. If you plan to see it in theaters, do so A.S.A.P! It's opening weekend and I saw a 9:30 showing in a theater with only 3 other people. That is an awful opening week for any film. I wouldn't be surprised if it was out of theaters by next Friday. Visually speaking the landscapes aren't that impressive so it may be just as well to wait for it to come out on DVD. 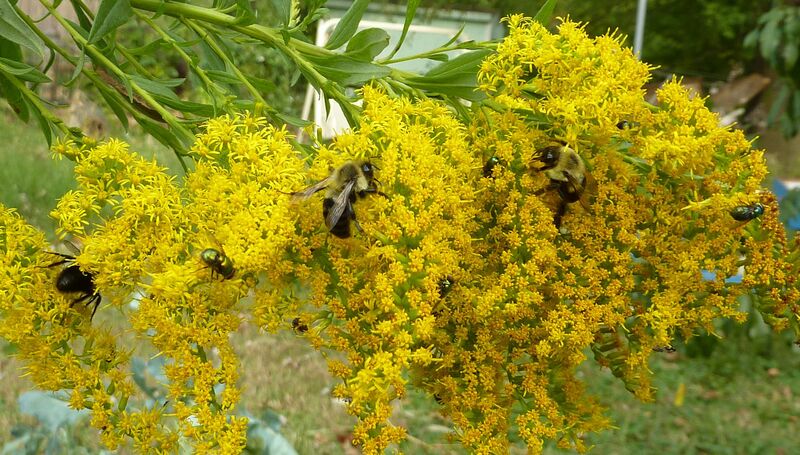 Solidago altissima, Tall Goldenrod, is one weed I've come to love over the years. This plant originally sprung up in the middle of a small butterfly bush I used to have. My views on what plants to keep in the garden and what not changed so I got rid of the butterfly bush but kept the goldenrod. Never in my wildest dreams did I expect it to get 13' tall. In a way though that's a good thing. Even when the canes fall over they still stand 4' off the ground (left). Because of it's height I find it's best viewed from a ladder or second story window. I could see even placing it next to a shed for some close up action. The greenhouse there is not strong enough for my weight sadly. This isn't really one plant per-say. There's no massive rhizome in the middle of all this that I know of. Really those are all canes coming up from the root system. They're easy enough to simply pull out of the ground where annoying. Canes that fall in the way of the path can simply be cut, there are plenty of them after all, and allowed to flower from offshoots that form below. Each year it tries to spread out in farther but I find it easy enough to pull those canes out or stab them with a shovel. 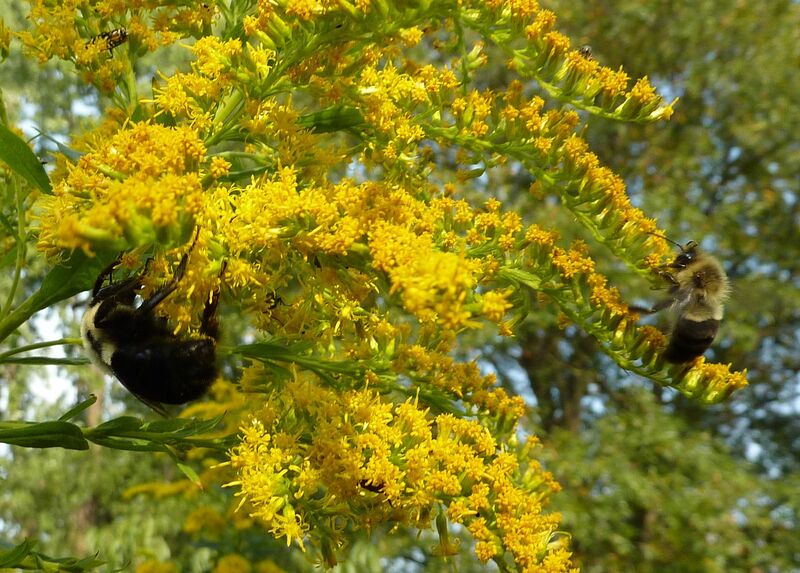 People who work on prairie restorations typically don't like goldenrods, that is to say to many of them, because they have a habit of taking over. I'm not sure what effects fire or grazing having on goldenrods but I'm sure something must keep it in check. S. altissima blooms much later than most other plants. It would be the latest flowering thing in my garden if not for a single white flowering Chrysanthemum that keeps coming back. 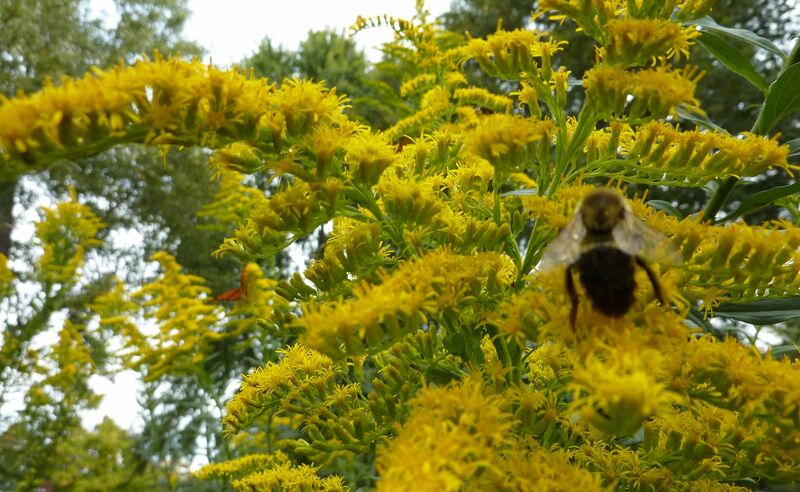 New England Asters seem to be a richer nectar source and all the honeybees are favoring that over the goldenrod. That's going to change tough by the end of the week when the asters all stop blooming. 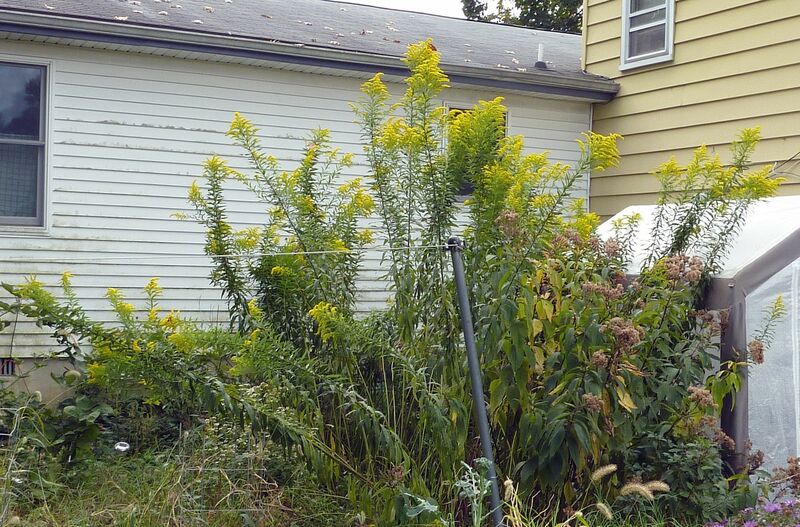 This goldenrod will be flowering into November before it's done. For now thought it's all you can eat for the bumblebees and butterflies. 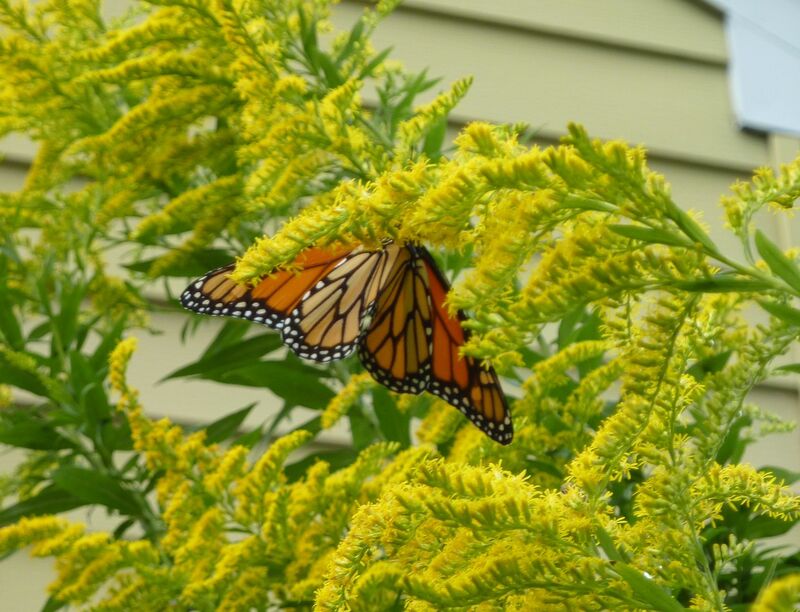 This is the first year I've noticed Monarchs going for the goldenrod. It's not one that I raised and released. They certainly favor the New England Asters too but like I said that will be done blooming by the end of the week. 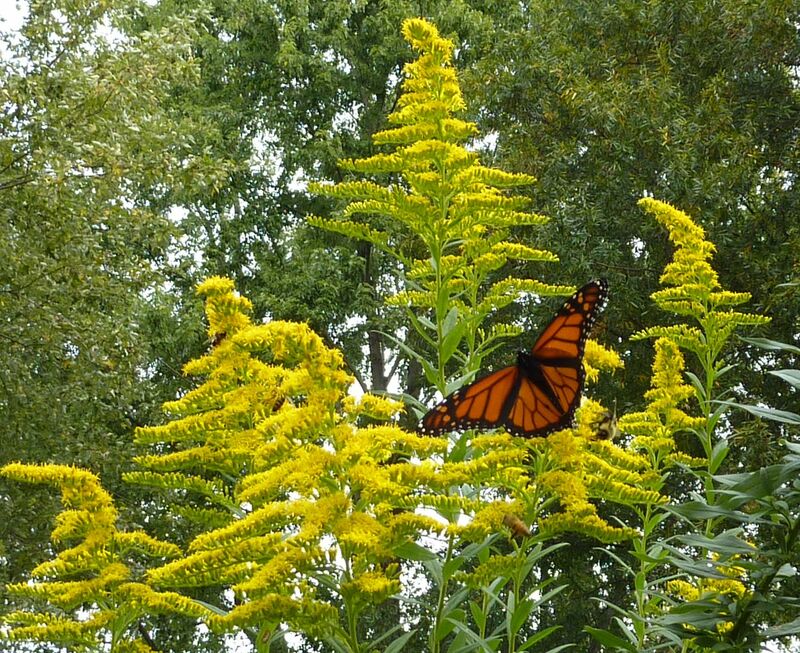 One bad thing about this goldenrod is it's height makes taking pictures a little tricky. 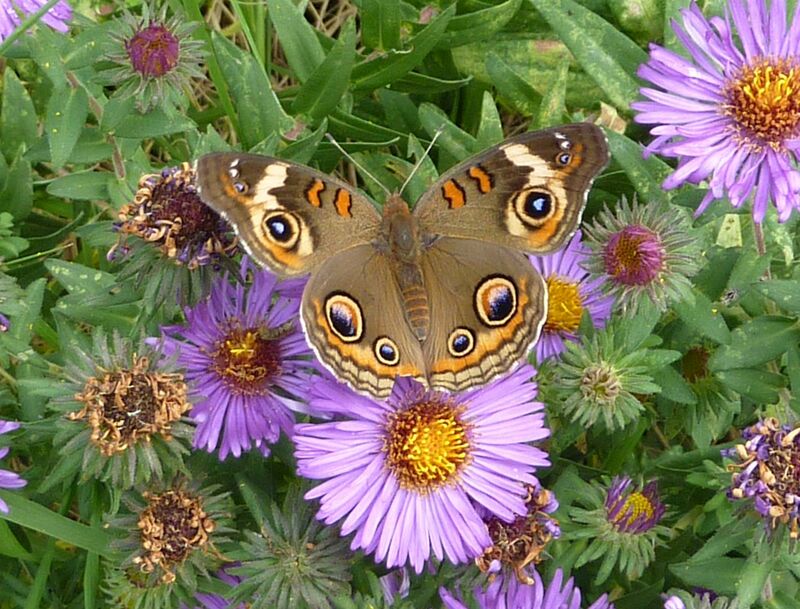 I still have some Buckeyes fluttering around the New England Aster. I'm seeing lots of honeybees too but I feel like I've photographed them to death to a point. Buckeyes are pretty in that their wing patterns almost look like they're fake. It's almost an imitation of a butterfly, like something a child would draw on paper and make into origami. Their pattern reminds me of those fake butterflies gardening catalogs sometimes use to promote plants as "butterfly friendly!" They're pretty all the same. "Rambunctious Garden" by Emma Marris starts out as an excellent read on conservation issues around the world, but then takes an odd turn halfway through that sadly never returns to it's former greatness. Leave it to a chapter on invasive species to ruin a good thing. I wish the format of the book were laid out somewhat differently. For starters there are no pictures, which is a real issue considering the author traveled around the world. Did she really not bring a camera? Images would have helped when she talks about some of these invasive plants from foreign places. Plants are otherwise only mentioned by common name, and I consider that to be a serious no no when writing to an informed audience. Also she presents information in an odd way, her voice is more of a reporter and I get the feeling this was intended to be a documentary at one point because it doesn't always work in a novel format. This laid back reporter tone only makes the abrupt switch in tone more noticeable come chapter 6. By the end of chapter one I honestly wanted to throw this book in the trash. Her argument that conservation is an arbitrary thing is interesting but lacks sufficient evidence early on to be taken seriously. She comes off more as someone attending a tour of a nature preserve who raises their hand and goes, "Well a million years ago there was ice a mile high where we're standing ... what's that say about your conservation efforts?" She's almost rude about it. I'll admit I never thought about conservation in as broad an historic sense as she talks about, but why bring it up at all? She might as well have elaborated that in dinosaurs once walked the earth, or even further and said the earth used to not exist. What is your point? Following the old librarian rule that you have to read at least to page 50 before you can stop reading, I pressed on. Halfway though chapter two things started falling into place. I was getting it. Her argument is hard to talk about without a few examples, and to my delight it feels like she gives you 100 of them all while telling the history of the conservationist movement. Chapters 2 through 5 are an absolute delight to read. She tells the formation of Yellow Stone, she travels around the world looking at different ideas and concepts of conservation, all of which is fascinating and each one worthy of it's own book. She talks about issues facing conservation, why picking some date out of the history books is arbitrary given the history of the earth so far, and she makes each point beautify. To elaborate, in North America the general definition of what we consider to be native. Most conservationists agree anything living in North America before Christopher Columbus first stepped food here is native. However, at the time North America was currently inhabited by more Native Americans than there were people living in Europe. Smallpox devastated 95% of their population in the first 100 years of interaction with European settlers! During the time prior to European colonization, Native Americans were setting fires across the continuant to make prairie land to boost game populations, and had already driven several large mammals into extinction. These large mammals interacted with the plant life here differently, distributing seeds, shaping the land, and functioning in ecosystems in ways now lost to history. In essence some of our native trees aren't as abundant today as they should be because the beast eating and distributing their seeds have gone extinct. Generally humans have had their hands in everything, everywhere on earth, and this idea of a pristine wilderness is a delusion at best. When Yellow Stone was first formed they had to relocate people off the park land, not just Native Americans, small towns worth of people were kicked out of their homes! For many examples she's delivering a level of detail that's just shy of being compared to that found in Guns, Germs, and Steel: The Fates of Human Societies. And one thing she makes clear is preserving this one glimpse of human history is a pipe dream at best. Issues like climate change are changing whole ecosystems, how much rain fall, the average temp, really drive home that at some point compromises have to be made. I wanted to read more about these complex issues facing so called pristine environments around the world! When one looks at the big picture we realize that the earth is still spinning, things are changing. What will the future ecosystem be in a given area? Sadly Chapter 6 comes along. We open with a vague example of an island getting logged, and replanted with nonnative plant somewhat picked at convenience. These faster growing nonnative trees supposidly saved 2 species of bird and 1 species of bad, hallelujah. But that is all the information we're given, end of story, moving on, stop asking questions, nonnatives are great, thank you, okay you really want to know... magic beans, moving on. There isn't any citation for this example at all. Could the bats and birds fly off of the island? If that's the case then really I don't think anyone would have cared had the island simply eroded away. 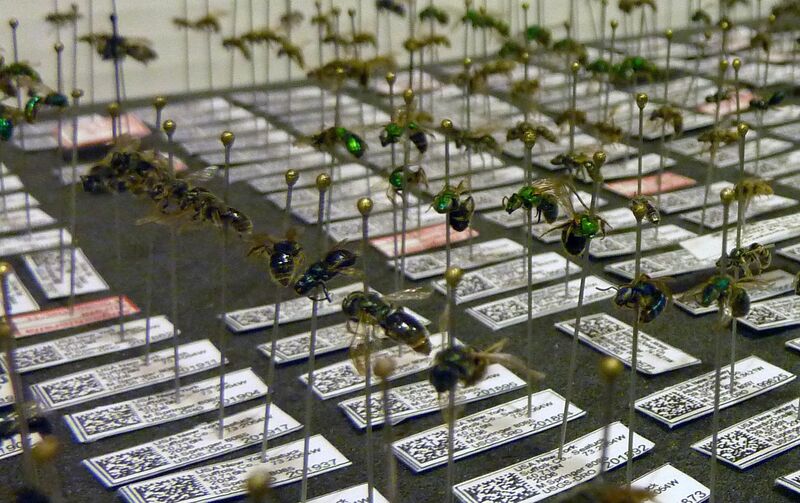 Where those three species the only thing worth studying on the island? From here we find a series of examples where compromise turned out to be beneficial. Drilling nest holes into the sides of a cliff for birds so they have more places to reproduce and hopefully out compete the rats, for example. This is the kind of success story I don't mind becuase it's a cheap way to ignore (fix?) the problem of invasive rat species on islands. But these types of examples lack the sense of value and history conservationists try to preserve. She goes on to support assisted migration. This is an interesting parallel here between intentionally introducing nonnative species. But that is hardly evidence that introduced species overall are beneficial to the environment. It's one thing to do it to save an endangered or threatened species, and quite another for mass marketed landscaping plants. The illegal pet trade and accidental introduction through human commerce are mixed in here someplace but not really addressed fully. Not that she needs to. Take your pick of life form and you can be sure someone's imported it. Chapter 9: I think this is supposed to be read as an enlightening kayak trip down a river teaming with introduced species, factories polluting the waters, and conservation projects all going on at once. Besides reflecting the world as it is, I don't think this chapter had it's intended impact on me. Basically she comes to the conclusion that we have to incorporate nature into our lives. The last chapter reads as a laundry list of goals one can have towards plants. I thought it was a waste of paper, got bored after goal #6 and stopped reading after that. Forests are fragmented to the point that their ecosystems are islands. That's why invasive species are bad and people should be doing more to fight them, not ignore them! When someone tracks mud through your house you don't throw up your arms and never clean the mess. Perhaps comparing invasives would be better compared to a hotel infested with cockroaches. You'll never be rid of them unless everyone allows their apartment to be sprayed with insecticide. If one person refuses then the cockroaches have a safe harbor and eventually will infest the whole building again, it's hopeless. But this is such a limited view. We should ask, why is this species invasive? The answer is, as the author tries to say, it's because it's doing what it would normally be doing in nature. It's thriving in an environment where it's absolutely flourishing. The difference between a nature preserve and your front lawn is competition. Your front lawn is doing everything land after a massive forest fire, mud slide, or volcanic eruption would do. It's a disturbed environment with lots of open spaces that need filling. Weather it's native or not, aggressive plant species are going to show up and try and fill those holes. The longterm process of succession is about to commence. As the author points out during the time of the book I liked, some of these trees live for 1,400+ years! Climate change has been found to interrupt some of these species and we find places where the oldest of these tree species are only ~700 years old. Another issue that the author doesn't address is that there a coloration between the % of species and the % of land available. If we lose 1% of land then we lose 1% of the species there. Condoning nonnative species to establish, weather they're behaving aggressively or not, they eventually kick out other species. 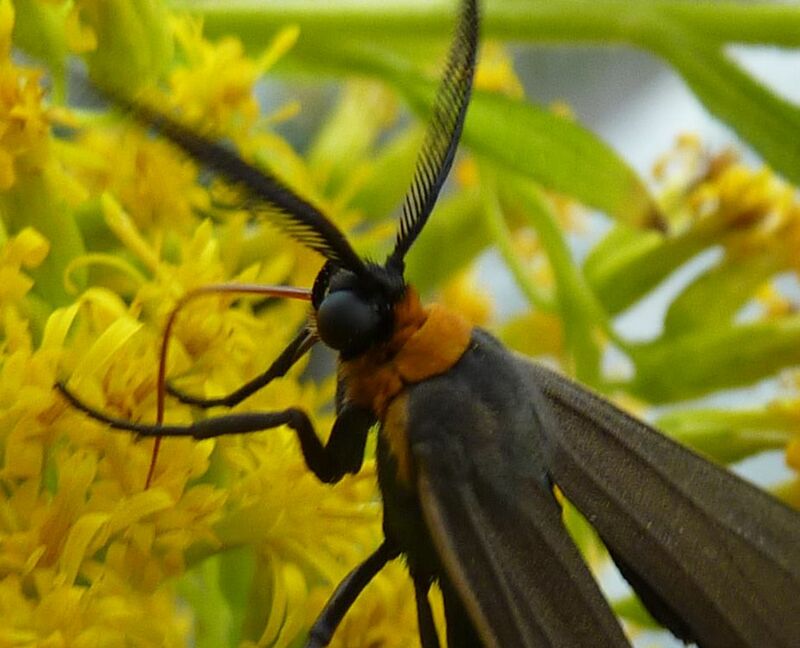 Often because native insects don't recognize them as palatable something is lost, weather it's the quantity of the insect, or the insect's prescience there entirely. 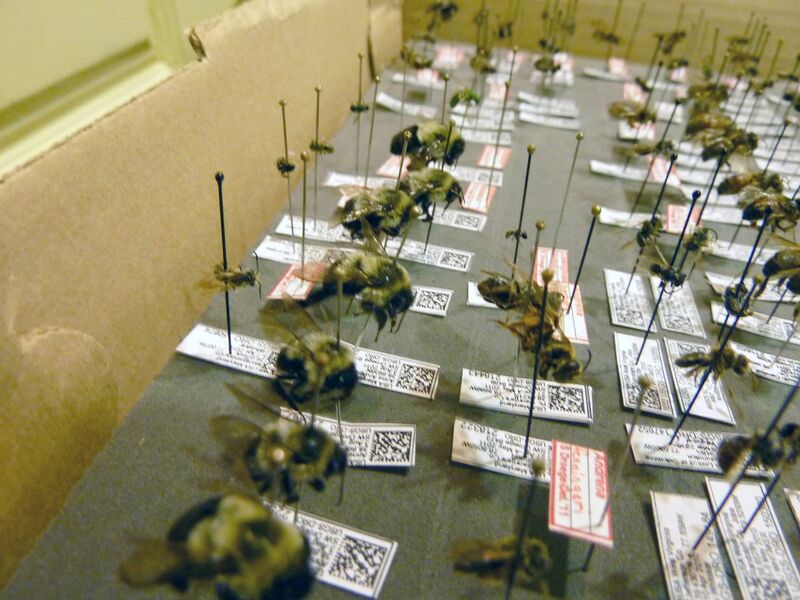 The author seems to think insects and diseases will eventually catch up with them, either by importation or one of the indigenous species taking a liking to them suddenly. And that's true enough but that doesn't mean we should let it have free reign over the continent for 500 years or more waiting for it to happen. What's more such plants are not worth protecting as the author suggests! To be fair she's talking about trees in general, not aggressive species in particular; basically nature deserves protecting despite it's content of origin. What's lacking with this idea is standards, value, and any real vision. I guess that's what chapter 10's list of goals is trying to get at, but her treatment of nonnatives, and invasive plants especially, really cripples the idea in my mind. Imagine a nature preserve that's comprised of Kudzu blanketing over dead trees it's turned into topiary corpses. Longterm readers of my blog should recognize a lot of the pictures here as one's I've taken. I've included video and music too!